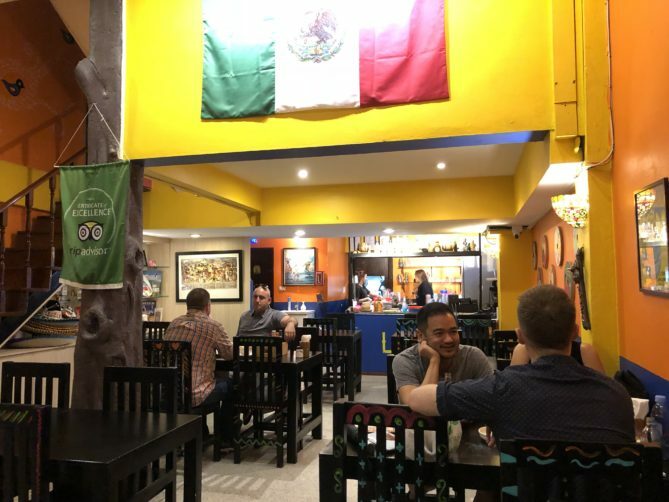 Tacos & Salsa and it’s bright colored interior, far away from the earthy colors of Frida Kahlo, was a pleasantly surprise. I have to admit that I came with moderate expectation, and you can discuss the authenticity of the food, but I rolled out well fed. The damages to my wallet was acceptable, but not like you run down the streets to eat there. My eating companion, slightly more skeptical than me at the arrival, stated after the meal that she would happily go back another time. Tacos & Salsa is true comfort food. Our visit at Tacos & Salsa didn’t start out the best possible way. 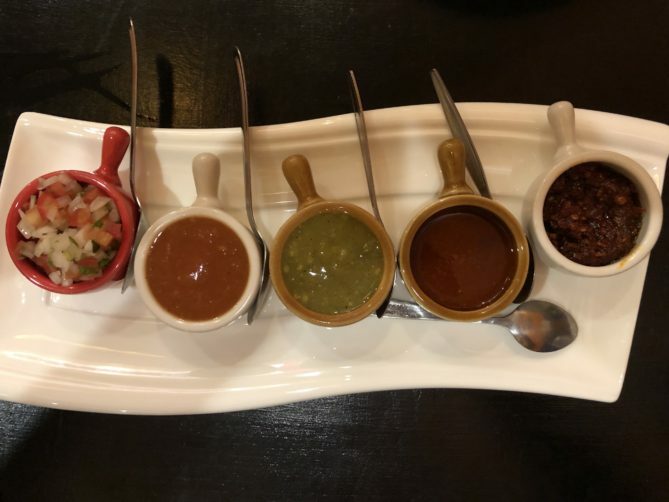 The salsa plate appetizer that consisted of 5 different “dippings” (40 Bath) and corn chips (60 bath) was a little bit disappointing. They spread out being spicy, sweet, sour or tangy, but little boldness are put into the making. The exception was the Salsa Macha with roasted dry chili and garlic in oil that came out with a good complexity. The other four dipping bowls are rather straight forward with no eyebrows being raised. They are also not what I would call spicy, as stated in the menu. Anyway, the Salsa Macha came out as a good and clear favorite. The rest of the food we ordered came in decent plus to very good. I have a weakness for avocado so it came very natural to order their 160 bath guacamole. And yes, It didn’t failed to deliver. Creamy, fresh and with tomatoes, chunks of white onion, garlic, cilantro, and lime intermixed. It is not a spicy guacamole in case you prefer that (as some do). 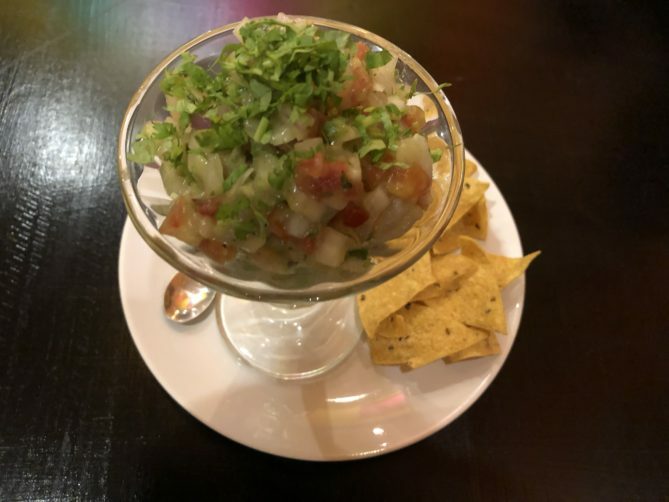 And when the ceviche with fresh prawns (220 Bath) came to the table, full of flavors without being too limy and with a good texture, I leaned back in my chair. 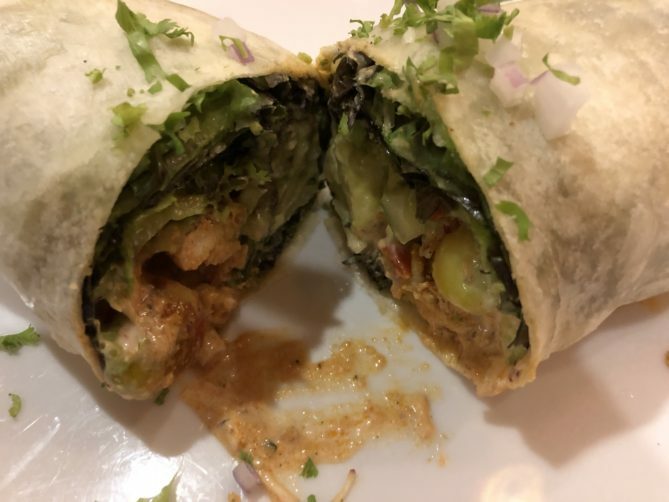 The huge healthy chicken burritos with grilled chicken, mixed greens, onion, tomato and cucumber and a creamy dressing was nice and very filling (250 bath). Slightly too cold, but mostly with a correct texture and taste, maybe except for the creamy dressing that reminded me too much of the classic toasted Island reaching it’s popularity top in the 80s. My dinner companion and good friend on the other didn’t reacted to much to it. I’m a fan of enchilada, but lost the competition on what to choose as a laste dish to my companion who wanted the quesadillas (250 bath). Who doesn’t like melted cheese, so I wasn’t difficult to convince. That one also came in a bit too cold, but it was cheesy and with a nice texture to the tortilla (not soft). It certainly had a bite to it. We did go for chicken as the protein here as well. Our favorites this evening was the guacamole and the ceviche, with the Salsa Macha coming in third. We didn’t taste the margarita, but it is always good to have something to come back to. Be aware that they have weekly specials on Monday to Wednesday. We didn’t eat dessert, but they do have desserts on the menu, for example churros (deep fried pastry covered with cinamon sugar etc) and a chocolate flavored Mexican style caramel custard. 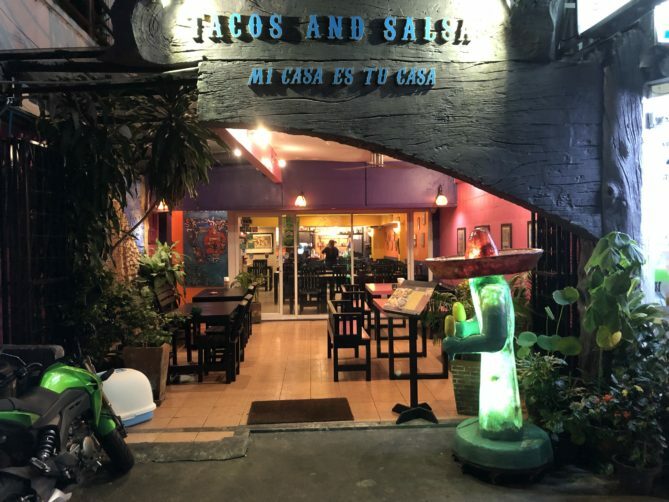 Tacos & Salsa is a straight forward eatery with bright color decor, not pretending to be anything else. 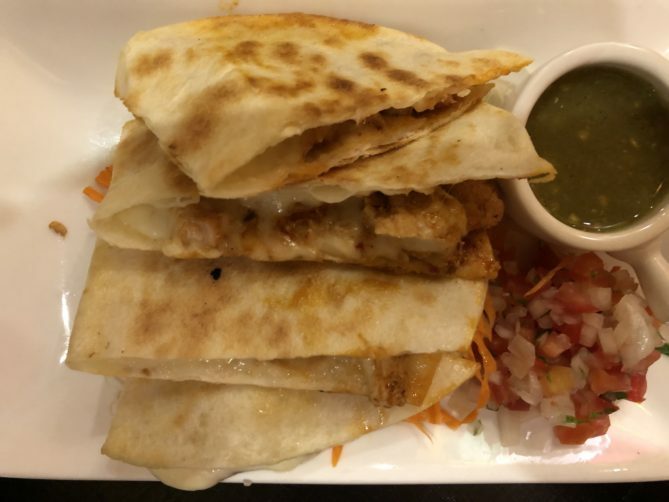 I would presume it is a rather popular neighborhood spot, but if in for some Mexican, it is worth the walk from BTS Asoke/MRT Sukhumvit, even if the prices are a bit on the hight side. Be aware that service charge (10 %) is not included in the prices. Our total came in at 1408 bath including one San Miguel Light (100 bath) and one mojito (200 bath). http://sanfordbiggers.com/bio order now Price: 1430 bath for the four dishes. I would estimate around 600 bath a person for food and one bear. Add another 100 bath if you for the coctails. How to get there: Take the BTS to Asok. From there take the skywalk to cross Ratchadapishek road and take the stairs down on the Exchange Tower side: Then just walk util you get to Soi 18 and walk for another 4 minutes. Tacos & Salsa is good Mexican comfort food. 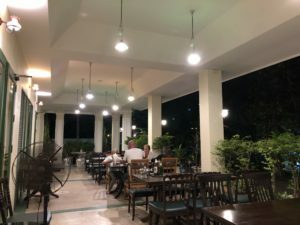 It is slightly on the pricy side, but still worth a visit and the walk from BTS Asok or MRT Sukhumvit. A straight forward neighborhood ambience. See full review at StreetsideBangkok.